Arbitration tribunals may levy execution on mortgaged property | Russian Legal Information Agency (RAPSI). MOSCOW, May 26 - RAPSI, Sergei Fetlyunin. The Constitutional Court of the Russian Federation declared as constitutional legal provisions authorizing arbitration tribunals to consider real property disputes, including mortgage agreements and levying execution on mortgaged property, the court told the Russian Legal Information Agency (RAPSI). The resolution was adopted upon the Supreme Commercial Court’s request. 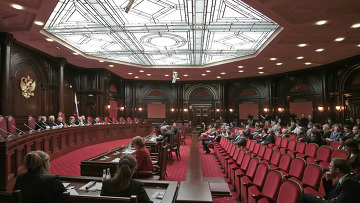 The Constitutional Court was tasked with determining if arbitration tribunals are entitled to enforce security like government commercial courts, including mortgage foreclosures, and if they are part of the Russian legal system or an alternative route of disputes resolution. In response to the request, the court said arbitration tribunals are a generally accepted method of resolving civil law disputes based on the freedom of contract and the autonomy of will in civil law. The Constitutional Court did not consider the competence of international commercial courts. Anton Ivanov, the head of the Supreme Commercial Court, said he personally does not know which status is better for arbitration tribunals, although equal status with government commercial courts will make arbitration proceedings public and more open. 15:09 26/05/2011 The Constitutional Court of the Russian Federation declared as constitutional legal provisions authorizing arbitration tribunals to consider real property disputes, including mortgage agreements and levying execution on mortgaged property.